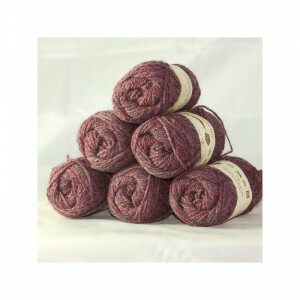 It is two ply, jumper yarn (knits as 4ply) from Jamieson & Smith in Lerwick.Â The colour is rather nicer than I managed to show in this photograph. While I was at the Jamieson & Smith website I discovered that they sell tops and that they sell them at a very attractive price!Â Not only that, they offer sample packs.Â What is a girl to do?Â Of course — get a hold of those samples! 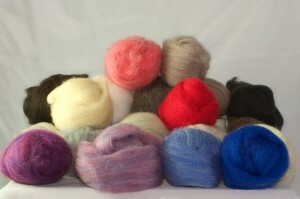 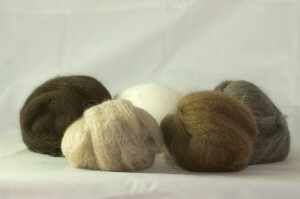 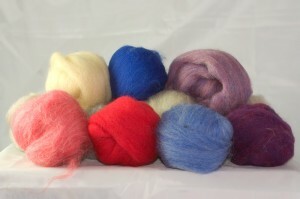 The natural pack consists of 25g each of five different colours and costs a paltry Â£3.58. The dyed pack weighs 350 g and has samples of 14 colours — it will set you back a whole Â£7.50. The blended colours appeal to me more than the flat ones. That is the show part, should I now tell you what I plan to do with them?Â That is a bit difficult, because I had no plan in mind when I bought them.Â I may spin some of them for weaving practice but I have a little something special in mind for the natural colours, and I think I shall be felting with them.